Students perform experiments centered around Charles’ Law, the relationship between the temperature and density of air, and the relationship between the density of air and atmospheric pressure. Through experimentation, students become more aware of how changes in the temperature of areas of the atmosphere produce changes in its density. Also, students gain an understanding of how the rising and sinking of air that results from changes in density can produce changes in atmospheric pressure and the development of high and low pressure centers. Experiments are conducted that simulate the creation of high and low pressure centers and initiate pressure gradient forces as a way to understand the causes and characteristics of wind. Through their experiments, students gain a better understanding of atmospheric events, weather phenomena and the scientific principles that govern them. Gain an understanding of how the unequal heating of the Earth’s atmosphere causes the movement of air within the atmosphere. Learn what impact increases in temperature have on the volume of a ‘parcel’ of air. Recognize that as the temperature of a gas increases, its volume increases (Charles’ Law). Investigate how changes in the temperature and volume of a gas affect its density. Gain an understanding of how changes in the density of air result in movement of air in the atmosphere. 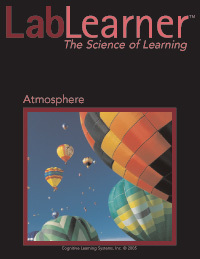 Expand students views of weather and the atmosphere to include the idea that weather is a phenomena that occurs as a result of changes in the physical properties of a gas. Introduce students to the concept of atmospheric pressure. Model changes in the movement of air associated with low and high-pressure centers or systems. Correlate the high pressure and low-pressure symbols on a weather map with an understanding of how the air is moving in the atmosphere. Understand that wind is the result of differences in pressure between areas in the atmosphere. Explore the concept that wind is the horizontal movement of air that is initiated by a force called the pressure gradient force. Promote the concept that the direction that wind blows is always from an area of higher pressure to an area of lower pressure. Understand that the greater the difference in pressure between two areas, the greater the strength of the wind. Create a model of a barometer and learn to use the model to simulate how changes in atmospheric pressure are measured with a barometer. Model the decrease in the temperature of the troposphere that occurs with an increase in altitude. Understand how the rising of a warmer air mass into cooler levels of the troposphere can result in condensation, cloud formation and precipitation along a front. Promote student understanding that condensation and precipitation result from changes in the rate of evaporation and condensation of water and water vapor in the atmosphere. Correlate the changes in pressure that accompany the passing of cold and warm fronts.